October 12 - The Russian Orthodox Church observes the Transfer of the Right Hand of the Forerunner from Malta to Gatchina (1799). Also, St. John's parents Zechariah and Elisabeth, are commemorated on September 5. 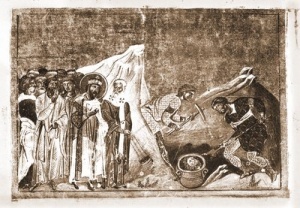 Miniature of the Finding of the head of St. John the Baptist (Menologion of Basil II, 10th c.). Translation of the relic of the Right Hand of John the Baptist - OCA Website. Priest Maxim Massalitin. 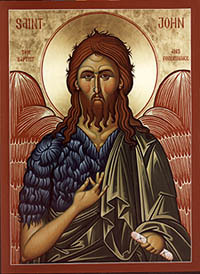 The Untold Story of the Head of St. John the Baptist. Pravoslavie.ru (Translation by OrthoChristian.com). 07/03/2012. This page was last edited on January 15, 2013, at 20:39. This page has been accessed 104,976 times.